Takeaway: Flanges, valves and piping collectively continue to be a major source of hydrocarbon leaks and releases, according to HSE guidance. For flange repairs, major oil & gas companies have begun testing cold-applied, 100% solids composite technology, which provides robust compression strength while eliminating the need for hot work and long downtimes. Marina Silva is affiliated with Belzona Inc. and can be contacted using the options on the right. For info on how we work with industry partners click here. All pipelines and pipework incorporate flanges and welded joints of varying sizes, designs and materials. 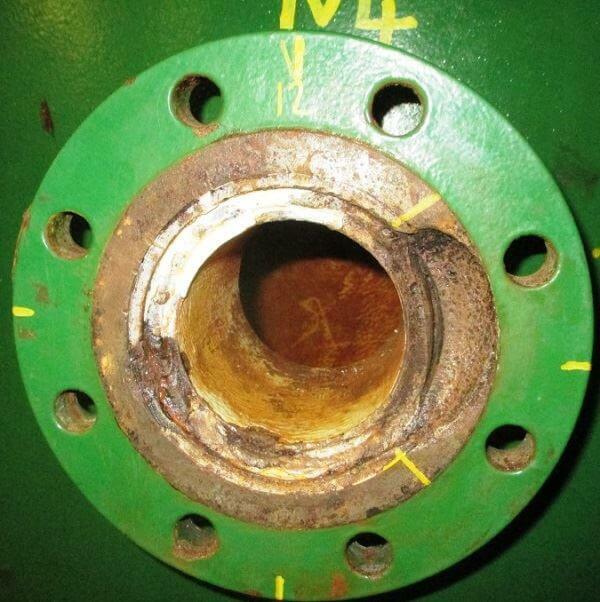 According to the Health and Safety Executive (HSE) Offshore External Corrosion Guide, flanges are one of the six main areas of concern. Evidence suggests that piping systems, including flanges and valves, collectively continue to be a major source of hydrocarbon releases, with piping being the single largest contributor. Transmission of hydrocarbon products in the pipeline exposes flanges to corrosive action of sour gases (H2S, SO2) and chemically aggressive fluids at elevated temperatures, causing the pitting of pipeline internals and flanges. Thousands of flanges are affected annually on offshore platforms, process chemical facilities and water treatment plants, posing serious and costly problems. Corrosion may propagate from localized areas to the whole of the flange face through different corrosion mechanisms. For this reason, the industry has put a lot of effort into developing non-destructive methods. Traditional non-destructive inspection techniques do not identify the rate and type of corrosion, while newer phased array flange inspection technologies and methods are still relatively expensive. 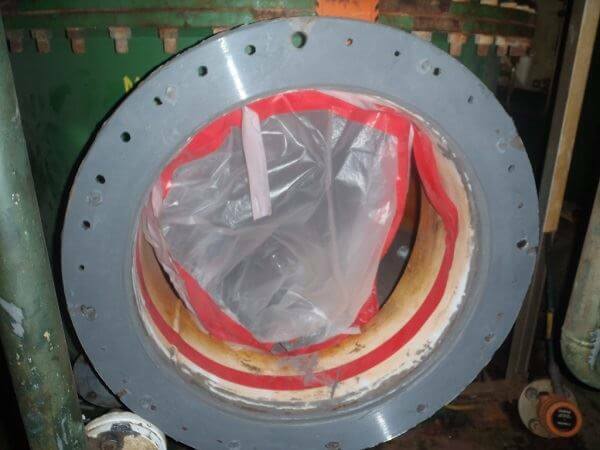 Vessel and pipe spool flange face damage becomes apparent only when adjacent pipe spools are removed, or if a flange starts leaking either in service or during a leak test. In both cases, the equipment’s integrity has been lost. Crevice corrosion has long been the "Achilles' heel" of stainless steel flange equipment in seawater service, where corrosive materials concentrate between the crevice of the sealing surface and gasket material. This type of corrosion is accelerated by the presence of hydrocarbons with a high percentage of H2S and chlorine. Flange corrosion will, at some point, cause subsequent leakage. Considering today’s economic and environmental climate, where leaks are not only costly but can be hazardous to the environment, it is more important than ever to implement a sufficient corrosion prevention plan. Repeated cutting and welding may introduce more galvanic problems to the pipe joint and the use of heat can distort the substrate, leading to further stress-cracking propagation that could cause accelerated flange corrosion. Site machining and weld buttering requires specialist equipment and hot work, necessitating a hot work permit for welding and cutting. In addition, when flammable materials are present, a plant shutdown may be required. Where possible, it is advised to avoid hot work, thus eliminating health and fire risks and speeding up the turnaround. A viable alternative is the use of epoxy composites that bond strongly to the flange sealing face, and thus completely isolating it from the operating environment. This 100%-solids composite technology has been on the market for over 50 years, but is only now gaining acceptance for flange face repair applications. The corroded 24" flange face after composite repair. The material discussed here is is an epoxy-based composite for metal repair. The system is cold applied and does not require hot work or specialist equipment. The risk of sparks is furthermore eliminated by minimized surface preparation requirements. Once mixed and applied, the epoxy paste grade composite acts as a permanent gasket, having excellent compressive strength as per ASTM testing. Epoxy composites adhere strongly to a variety of metallic substrates, eliminating galvanic corrosion. However, these systems do not add mechanical strength and would not be suitable in situations where the flange has corroded beyond the corrosion allowance. The application procedure includes manual surface preparation, mixing and applying a paste grade composite to a corroded or damaged substrate using a mating flange or a prefabricated former to form the flange face. Provided the necessary equipment is at hand, the repair can be delivered within hours with minimum interruption to the process flow. 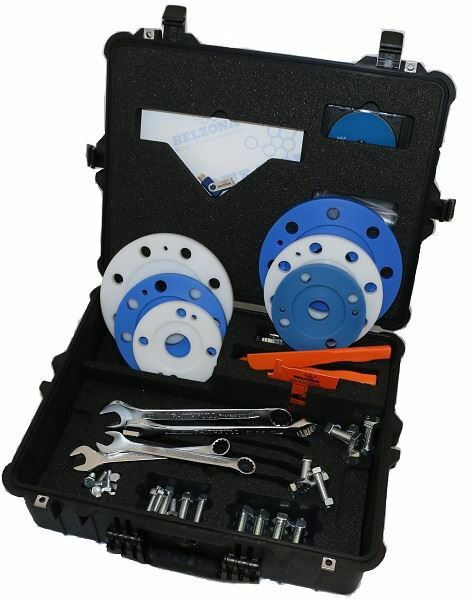 Accessory kit for flange face forming applications. Prefabricated formers can be metallic or plastic, and are ideally reusable in order to reduce application costs. Accessory kits containing formers and other relevant tools are made to simplify and streamline applications. Vigorous laboratory and field testing has been performed over the last decade. Results to date show that epoxy materials may be recommended for the protection or repair of weld neck flanges and ring-type joint flanges. Testing carried out by Wood Group in 2003 confirmed that epoxy materials can be used for the repair of flanges for #150, #300, and #600 pressure rating systems, as shown in Table 3. Some of the largest independent crude oil and natural gas producers in the world have standardized the use of polymer materials, where possible, for the repair of flange faces using similar forming techniques described in this article. The use of polymer repairs, when undertaken following manufacturer’s guidelines, is effective in creating a suitable sealing face and preventing crevice and galvanic corrosion. Table 3: Wood Group flange face forming performance data at different operating conditions. 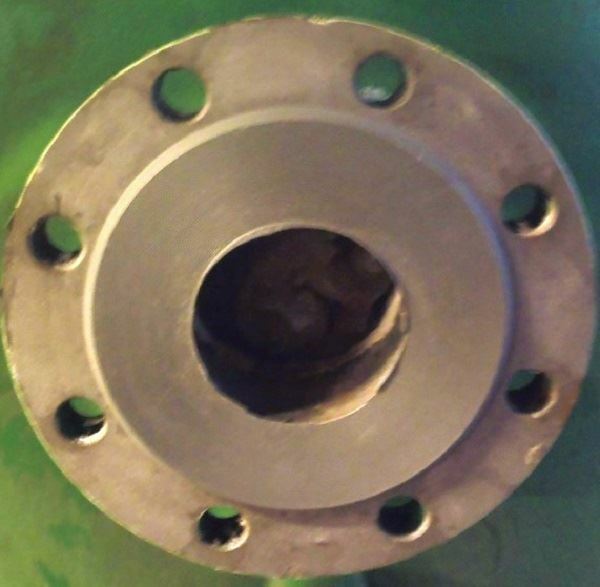 Corrosion of the flange face is a common problem affecting pressure vessels, where the face needs to be completely isolated in order to prevent oxidation. Back in 2008, corrosion protection was required on four new-build pressure vessels, two desalters, a dehydrator and a separator. This equipment was designed to handle hydrocarbons at 248°F (120°C) on a Brazil FPSO. These vessels are critical pieces of equipment that remove high salinity formation water from the crude oil stream. After carefully evaluating design and operating temperatures and pressures, as well as anticipating chemical resistance requirements, a total vessel corrosion protection solution was specified. The entire vessel was internally lined with a ceramic-filled novolac epoxy coating. Difficult-to-access areas that commonly suffer from corrosion, such as small bore nozzles and flange faces, were isolated from the environment with the use of epoxy coatings and composites. Prefabricated formers were designed to form the material on the raised flange faces. The vessels were then put in service on the FPSO operating in the Jubarte field for the next three years. In February 2013, one of the vessels was opened for inspection and the result was described as “flawless”. The lining, composite-formed flange faces and small bore nozzles were all in excellent condition with no signs of deterioration. In November 2014, a deck water seal of an inert gas generator system on an FPSO that handles seawater at ambient temperatures suffered internal corrosion. Existing coating failure led to severe metal loss on the adjacent flanges. Reformation of 2", 4" and 24" flange faces was created with the use of formers and an epoxy composite material. Corroded 4" flange face before composite repair. The application was carried out over a weekend and the entire solution, from first notification and including former fabrication for the 24" flange, was completed in less than a week. The vessel was returned to service with minimum disruption to the production cycle. Corroded 4" flange face after composite repair. The use of composite materials for flange face repair and protection is a viable alternative where hot work is undesirable and shutdown may be too costly. Further innovations in polymer materials include faster cure times, surface tolerance and simplified surface preparation techniques, making the composite technology even more attractive in both flange maintenance and protection situations. Health and Safety Executive, HSE offshore external corrosion guide, 2006. Health and Safety Executive, HSE information sheet. Hydrocarbon Releases (HCRs) Offshore. Offshore Information Sheet No. 2/2009. Evaluation of flange face corrosion using phased array ultrasonic testing (paut) in process industry. Author: Gopal Sankar, R. Subject Area: Physical Sciences and Engineering. International Journal of Current Research Vol. 5, Issue, 03, pp. 493-500, March, 2013. Guang Xi Jin, et al. “Corrosion failure analysis of the condensate collector vessel head of evaporation system in ethylene glycol device,” Engineering Failure Analysis, Volume 22, June 2012, pp. 113–120. Health and Safety Executive, HSE information sheet. Stress corrosion cracking of duplex stainless steel piping systems in hot chloride service. Offshore Information Sheet No 7/2007.